Ceremonial sanctification of a new flag has been an important part of the celebratory ceremony for many generations. Moreover, the act of sanctification of your flag is a great opportunity to present it officially to the general public. The sanctifying ceremony may take place in the church or at another worthy place. We will be pleased to develop for you the complete ceremonial procedure of sanctifying of your flag or presentation of your symbols to the public. At this point, our family firm has really rich experience as we often take part in these important special events in person. At the take-over, you will receive proposed procedures of this kind of events in writing. Note the difference between "sanctifying" and "consecrating". In the case of flags, we always speak about ceremonial sanctification of a new flag. "Consecration of a flag" is not correct because e.g. 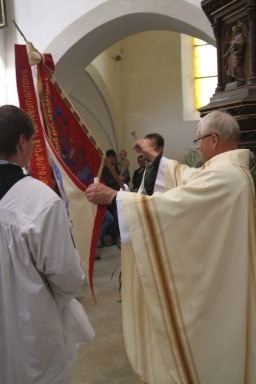 priests can be consecrated but not flags. Flags are always sanctified.